Traditionally, Bhutan the only Buddhist country surrounded in picturesque location between the mountains of Tibet Region of China and serene hilly states of India includes Sikkim, West Bengal, Assam and Arunachal Pradesh. A ‘Vajrayana Buddhist Nation’ and ardent follower of its teaching in every aspect of life have been symbolized in this small Kingdom of Bhutan as “The Last Shangrilla.” A unique nation culturally and environmentally, situated in the lap of Himalayas, Bhutan offers a great lure for hiking and trekking seekers and has a great diversity of flora, fauna and ecosystem. Landlocked by slopes of Himalaya, Bhutan is surrounded by Tibet Region of China on the Northern Side and the other side West & South by North Indian states of Sikkim, West Bengal, Assam & Arunachal Pradesh. 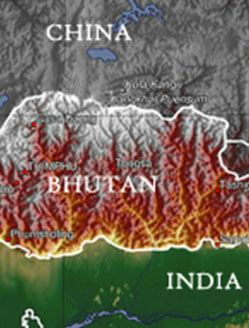 Lying between the latitudes 26 and 29 degree north and longitude 88 and 93 degree east, the terrain of Bhutan is mostly consisted of high Himalayan Mountains further infested by network of fast flowing rivers that gets slow in their pace as far as they progresses into region of Indian Plains. The heights of the surface ranging from 660 feet to 23,000 feet make Bhutan a country of diverse climatic conditions with a unique set of biodiversity and ecosystems. Most of the peaks are there in northern region of Mountain with the highest point of Bhutan Gangkhar Puensum at 7,570 meters high. The central region of the Bhutan is formed by Black Mountains that is water fed by two important river systems: the Mo Chhu and the Drangme Chhu. The height of mountains in Black Mountain ranges between 4,921 and 16, 158 feet above sea level. Due to fast flowing rivers many gorges has been formed there. The southern Bhutan is mostly made of Shiwalik Hills that has landscape made up of dense Himalayan subtropical broadleaf forests, alluvial lowland river valleys and very diverse flora and fauna. In the south, the Shiwalik Hills are covered with dense Himalayan subtropical broadleaf forests, alluvial lowland river valleys, and mountains up to around 1,500 m (4,900 ft) above sea level. The foothills further reaches into the subtropical Duars Plain. One of the smallest countries in the world with a population of less than 800 thousand people living in an area of about 47,000 sq kms. More than 80% of the population of Bhutan lives in villages and depending on farming. People of Bhutan are not known for enjoying the lighter moments but they are always very sporty. They spend most of their free time in playing various outdoor sports such as football, archery etc. The people of Bhutan are very religious and social people and they celebrate their religious days and other holidays with utmost enthusiasm. Traditional sports such as archery, dego and khuru etc. are their favourite sports during the celebrations. 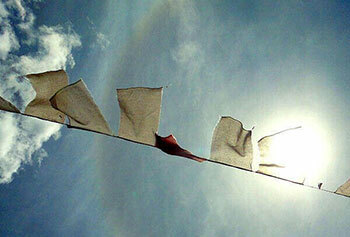 During festivals Bhutanese enjoy social gathering, feasting and drinking etc. There is not much evidence for earlier historical traces of Bhutan, however, according to some archaeological sites yet there first signs of civilization were seen around 2000 B.C. According to some beliefs around 7th century BC Bhutan was ruled by Cooch-Behar King, Sangaldip. The established traces of human civilization are traced to Bhutan with beginning of Tibetan Buddhism around 9th century when some monks exiled from Tibet, settled there. About 12th century, the Durkpa Kagyupa school of Buddhism, the most prominent Buddhist form in Bhutan was founded. Due to being the only Buddhist nation of the world monasteries and monastic schools played an important role in forming the modern Bhutan. The roots of present day Bhutan goes back to unification of Bhutan when Ngawanag Namgyal, a lama from western Tibet region Zhabdrung Rinpoche defeated three Tibetan invasions and took over the religious and administration of Bhutan by codifing the Tsa Yig an elaborate and complex system of law. After the demise of Ngawanag, the civil war broke out in Bhutan and for about 200 years it was in 1885 Ugyen Wangchuck was once again able to unite the Bhutan and began establishing relations with British in India. The unique location of Bhutan surrounded within massive Himalayan Mountains bordered by India to the south and China to the north has led the country to follow a policy of strict isolationism both culturally and economically. It was only there at the last decades of the 20th century were foreigners allowed to visit the country and that even in only a limited numbers. Bhutan has successfully preserved different aspects of its culture and dates directly back to the mid-17th century. The contemporary Bhutan has emerged from its ancient culture. Dzongkha and Sharchop, are the principal Bhutanese languages which are very closely related to ancient Tibetan language known to be as chhokey. Both Tibetans and Bhutanese revere the tantric guru, Padmasambhava, the founder of Himalayan Buddhism in the 8th century. The influence of Buddhism is very much visible in day-to-day life in Bhutan. There are several hundred of sacred monasteries, stupas, religious institutions and prayer flags make Buddhism a faith that is very much visible and live at every part, nook and corner of Bhutan. The attire of common citizen of Bhutan is very much authentic and realistic as is worn by and are mostly traditionally woven garments that people wear and the refined architecture and splendid cultural festivals that make Bhutan a marvellous country. Festivals in Bhutan are other major attractions to country that are colloquially known to be as Tshechu (“tenth day”) are organized at various temple monasteries and dzongs across the country. The Tshechu is celebrated on tenth day every month according to Lunar Calendar as per the birthday of Guru Rinpoche (Guru Padmasambhava). However, the months of the Tshechu varies from place to place and temple to temple. 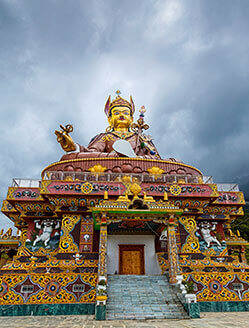 Tshechu are generally a large public congregation where people from different places come together to become a part of religious masks dances or ballets inspired from the incidents from the life of Guru Padmasambhava and be blessed by lamas. Each of the masks dance are based on story and the people become a part of it due to wash away their sins. 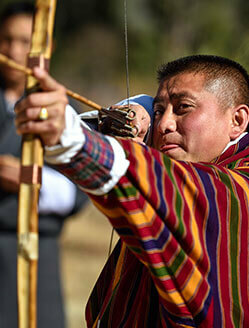 The event also consisted of colorful Bhutanese dances and other entertainment formats. Some other popular festivals that occur throughout the year include Black Necked Crane Festival, Chorten Kora Festival, Gomphu Kora Festival, Haa Summer Festival, Jampa Lhakhang festival, Kurjey Festival and Lhuentse Festival. Staple rice is a major meal of Bhutan. 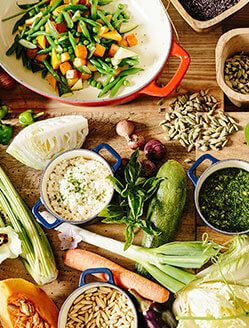 It is relished with vegetable, meat or any other accompanying cuisine. Chili is an important favourite ingredient in Bhutanese recipes. It is not only included in every dish but is also eaten raw and treated as a vegetable. So whenever, you order in Bhutan be clear about mentioning in order that you eat less spicy food. Hot-pot and Western European food like French Fries, Pork or Beef Ribs, Pizza, etc.’, are available in restaurants in Thimpu. Good Indian vegetarian food one can also find at restaurants located in Thimphu at Norzin Lam, the main street in centre of city on very reasonable and affordable prices. Being a very secured and secluded mountainous travel destination from centuries the maximum of souvenir are hand-woven fabric is respected globally for an excellent quality offered by it as wall hangings, table mats and rugs. Yathra (highly coloured woven material, Dappa (Handmade wooden bowls) and Bangchung (Bamboo woven baskets) are the most popular handicrafts among tourists visiting Bhutan. Majority of Bhutan comes under the telephone coverage and the international dialling code for Bhutan is 975. Accommodated to usage of the smart phone, the country has telephone call booths at all the major towns. The biggest mobile company of Bhutan B-Mobile has tie-ups with North American, European, and Asian companies for mobile roaming. Tashi Cell is another important mobile company located in country. Most of the hotels in Bhutan offer Wifi services and one can also have an access to WiFi at internet cafes as well. All the places of public gatherings have internet cafes. Hospitals and clinics can be easily found throughout the country though they may not be much advance according to the expectation of travellers from the western hemisphere. The indigenous medical facilities one can get at all district capitals and especially at national capital Thimphu. Waterborne diseases such as diarrhea, dysentery, giardia and even typhoid can occur during summer monsoon season. Use water that is thoroughly boiled and purified before consuming. To avoid any emergency always carry a first aid material including a few antibiotics and acetaminophen (paracetamol). Altitude sickness can happen as low as about 2,500m. So take precaution when starting on an expedition in the mountains. The local currency of Bhutan is Ngulturm (Nu). All prominent banks in Bhutan has ATM’s and a traveller can withdraw money through Visa & Master Card credit & debit cards & Cirrus/Maestro endorsed bank debit cards. Strong Australian dollar at major banks in Paro & Thimphu is equally accepted. About two dozen languages of Tibeto – Burman dialects are spoken in Bhutan except for Nepalese language that is an Indo –Aryan language. Dzongkha is the national language of Bhutan and other non-Bhutanese minority languages are also spoken along Bhutan's borders and Nepali-speaking Lhotshampa community in Southern and Eastern Bhutan. 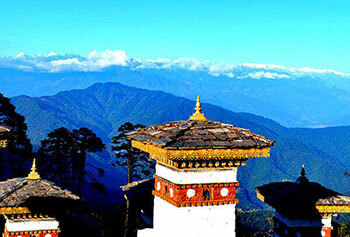 Best period of the year to visit Bhutan is around spring (March, April & May) and autumn (September, October & November). These seasons are very important with respect to cultural influence over Bhutan as these are the months when the most important Bhutanese festivals are organized in the country. Even, during the period of Spring and Autumn, the seasons there becomes very much ideal for trekking in Bhutan when the natural vegetation on Himalayan mountains gets in its full bloom and one can have a full and great views of Himalayan mountain peaks. However, winter seasons of December, January and February due to excessive and deep snow makes the High Mountains very difficult for trekking and travelling purposes. Visa is mandatory for tourist except for citizens from India, Bangladesh and Maldives. It is mandatory for tourist to book their journey to Bhutan through a local licensed tour operator or its international partner. One can apply for visa online and you are exempted for travelling Bhutanese Embassy or consulate. However, the holiday must be paid in full, via a wire transfer, to the Tourism Council of Bhutan account before a tourist visa is issued. Visa clearance takes no longer than 72 hours after receiving the payment. While entering into the Bhutan visa gets stamped in your passport on payment of USD20, two passport photos will also be required. 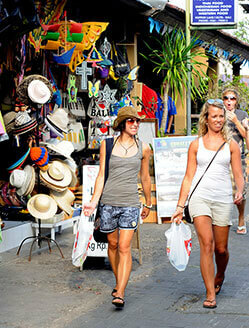 Visa extensions can be received through your local tour operator. Visas are issued on arrival to residents of India, Bangladesh and Maldives only. Paro International Airport (PBH/VQPR) is the only international Airport to make an entry into Bhutan. Located at the south-west of the country, it is served only by the Bhutan’s only flag carrier Druk Air. Bhutan also has two domestic airports including Yongphulla Airport in Trashigang in the east and Bathpalathang Airport at Jakar in the Bumthang District. Bagdogra Airport in Siliguri is the neighbouring Indian state of West Bengal is four hours drive away from the Bhutanese border town of Phuentsholing. For reaching Bhutan by car there are three border crossing area from Indian side including Phuntsholing in the west, Gelephu in the central region and Samdrup Jongkhar in the east. The Bus services between India and Bhutan regularly occur from cities of Kolkata, Siliguri and Phuentsholing. For travelling within Bhutan one can use cars, private and public transport bus services, hitchhiking, roads and food & refreshments. Despite being a smaller country, Bhutan’s weather changes from places to places due to varying heights at different places across the country. Areas of the country along the border with Bhutan remain undercover with snow throughout the year. The regions of Western, Central and Eastern Bhutan experiences European weather like climate. Winter season occurs from November to March, whereas, the southern Bhutan bordering with India remains hot and humid with a sub-tropical climate, however, Bhutan remains unaffected with monsoon waves from north India. As far as accommodation is concerned all towns in Bhutan connected with roads have hotel in varying price ranging from budget, economy and luxury hotels. The Five Star and High End hotels are mostly located at areas as Paro, Jakar, Punakha, Gangtey and Thimphu. However, the normal rates advertised for hotels are only for locals and visa exempted countries, especially, Indian Nationals. Other visitors can make an entry to Bhutan through being a part of tour for what daily prices are set by Bhutanese authorities to be around $250 irrespective of hotel rates. Situated in the virgin forests, Bhutan is developing its reputation among the adventure seekers. It is a perfect place for many adventure activities such as hiking, Trekking, Cycling, Kayaking, Rafting, Rock Climbing and Fishing etc. Whether you are travelling to Bhutan on a short trip or a longer holiday we organize all kind of adventure activities for you in Bhutan. Tshechu is the grand event in Bhutan. It is a religious festival celebrated in Monasteries all over the country to celebrate the birth of Guru Rimpoche (Guru Padmasambhava). The dates and month for this festival varies based on the locations of the monasteries. 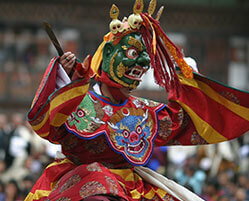 Travellers from all over the world come to Bhutan to participate in this grand celebration. Witnessing mask dane in Tshechu festival is a delight in itself. Paro and Thimpu are two of the most famous Tshecus in Bhutan. 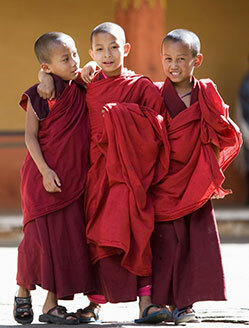 There are also many other monastic festivals that takes place in Bhutan every year. Our experts not only offer you latest information about the festival tours of Bhutan but they also organize your trip to Bhutan in such a way that you take back home everlasting memories of your visit. If you are looking for a calm and remote place to spend peaceful time doing sessions of meditation, a place to spend relaxing time in mineral hot spring bath, yoga or other natural wellness treatments, then Bhutan is a perfect place for you to rejuvenate your body, mind and soul. Bhutan is a paradise for the trekkers. Does not matter if you are looking for a short 2-3 days trekking trip or a 30 days long trekking experience. Bhutan has it all for you. Druk Path Trek, jomolhari Laya Gasa Trek, Snowman Trek, Nibji Korphu Trek, Merak Sakteng Trek, Thousand Lakes Trek, Gangtey Trek, Punakha Winter Trek, Bhumtang Culture Trek, and salt Trek Route etc are some of the hot picks for trekking lovers.